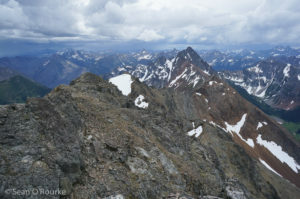 Azurite and Ballard are two peaks west of Glacier Pass on the PCT, rising 3500 feet above the South Fork of Slate Creek. I chose them because (1) Azurite is on the Bulger list, and (2) I could reach them from near Hart’s Pass, which is a pleasant place to camp. They turned out harder than I expected, offering the full Cascadian experience: amazing views, but also awful sharp scree, steep wet bushwhacking, and even a bit of surprise chossy 5th class. I wouldn’t recommend this outing, but as I slowly dried from my cold brush shower while hiking the PCT toward my car, I realized that it was what I needed. My “campsite” near the Slate Peak lookout had amazing sunrise views of most of the North Cascades, so I hung around to take a few photos before driving over to the Meadows Trailhead to pick up the south-bound PCT. This is probably the longest stretch of the trail in Washington that stays near or above treeline, so I was spared the usual morning soaking as I enjoyed views of Tower and Golden Horn from their best aspect. Azurite and Ballard were also visible, but mostly hidden as the trail traversed the eastern side of a ridge. I became less enamored of the PCT as it descended to Glacier Pass, in a series of maddeningly flat new switchbacks reminding me that newer trails are almost always worse. Glacier Pass is a weird “pass:” though it connects the Slate and Brush Creek valleys, no trail that I could find actually crosses it. Instead, the current trail descends to the saddle, then continues down the valley on the other side. I flailed around the forest for a few minutes, then took off through open and well-behaved woods toward Azurite’s base. 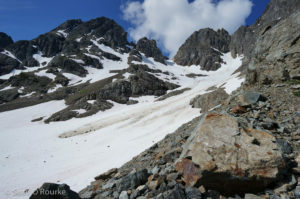 The obvious route in current conditions, visible from the approach, follows a large snowfield to a notch left of the summit; when dry, it would probably be an unbearable pile of talus, scree, and old moraine. The snow was soft and gentle enough that, with a bit of careful route choice, I did not need my crampons even on the steeper snow tongue to the notch. From there, I made a climbing traverse on the other side, across white granite reminiscent of the Sierra. 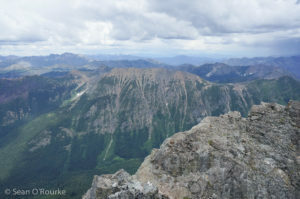 When the granite gave way to the normal Cascades rock, I climbed up to the ridge to get my bearings, and saw that I was several towers shy of the summit. The route from here was complicated, but not difficult, staying below the ridge as it traversed gullies and ribs, before making a final 4th class climb directly along the ridge to the summit. Befitting a Bulger, Azurite’s summit register contained several entries per year, going back to the late 90s. I was heartened to see that none of the few who had traversed from Ballard had any complaints or warnings, since the ridge looked awfully long. From the summit, I clearly saw both the new and the old Granite Pass trail, and resolved to follow the old one on the way back. 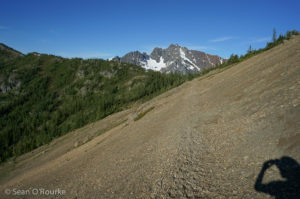 The initial scree descent north was the standard Cascades wretchedness: loose, sharp, and occasionally slick with moss. As the ridge leveled, it became possible to travel along the mostly solid spine, and I made good time. 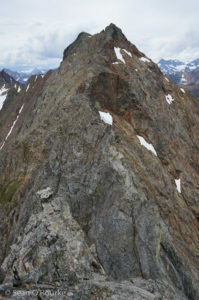 More than most ridges, this one punishes the climber for leaving the crest; when doing so to avoid a larger pinnacle, return as soon as possible. Most of the long, flat, red part is class 1-2, with the occasional class 3 move getting around or over a bump. But of course it couldn’t all be that easy. 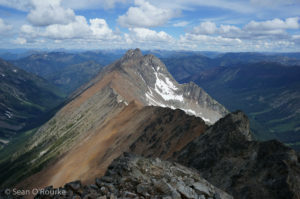 Just before it starts climbing to Ballard’s south summit, the ridge narrows, its west side sheer and right side steep choss. After again making the mistake of leaving the crest, and being punished by wet slabs, I returned to the top, which narrows to a fin of some gray, rotten rock near a dirt-chute to the east. After trying out a couple of options, I traversed the top for a bit, then descended a sloping crack to the right to reach the notch. While I had no close calls, the constant rain of pebbles I knocked to their deaths below was unnerving. There is probably an easier line farther down. After that, the rest of the climb was mostly third class on the left of the ridge, then up around the right to complete the summit knob. The “register” was a printed email about someone’s earlier climb, which had some useful pointers about my intended route down. Since it looked like rain, I spent only a few minutes on the summit before heading for the east ridge descent. 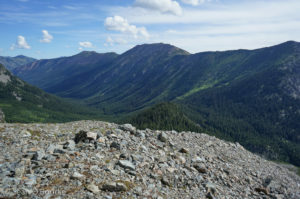 Circling around north of the summit, I descended a dirt-slope, then followed an old pair of boot tracks toward one of the ribs heading generally east-ish from the broad summit area. This proved mostly class 2-3, with a bit of trickery when I likely headed too far south, and I transitioned to the snowfield at the base without much trouble. Unfortunately, my ridge deposited me well down-creek from Granite Pass; I should probably have taken the other east ridge. It drizzled gently as I traversed along the snow and scree, making some progress up-canyon while staying out of the green hell. When the going got tough, I decided to drop down, having read in Beckey about “open woods” on the cross-country approach up Slate Creek. I found no such thing, but instead a mess of dense pines, alder, and slippery shrubbery. All of this had of course collected the day’s drizzle, so I got to take a cold shower as I thrashed and slid. Things improved slightly as I neared the bottom and found some bits of game trails, but I still had to cross a couple of broad slide paths. Eventually, I shortcut uphill to catch the PCT above Granite Pass, below the maddening switchbacks. The old trailbed was overgrown, but I knew where to look, and was already soaked, so I saved quite a bit of distance bypassing the hateful horizontal switchbacks. Above, it was a long, wet, gently-rolling hike to the car.